"We are seeing this is coming to pass," Alito said. He then referenced a famed Bob Dylan song lyric, "You don't need a weatherman to know which way the wind blows." He told the audience that while religious freedom has been recognized in Congress and in the courts, attitudes are not so quick to change. Alito also called on Americans to raise awareness of threats to religious freedom in the wake of Supreme Court rulings such as the Hobby Lobby case, where the company’s Christian owners objected to being forced to provide contraception in violation of their religious beliefs. Alito spoke for about 45 minutes, according to an AP report. He talked about the hostility faced by Catholics in the U.S. in previous centuries and his joy while staying up overnight as a Catholic youth in 1960 to witness John F. Kennedy’s election as the first Roman Catholic president. "I felt it had lifted me up from the status of second-class American," Alito recalled. While dissenting from the majority in the Obergefell decision in 2015, Justice Alito was alone in saying that marriage existed for the sake of procreation and child-rearing. He wrote that the majority opinion was based on ideas of romantic love. 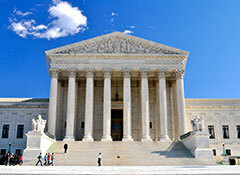 He had also expressed a concern shared by the other conservative dissenting justices that the Obergefell decision supplants the democratic process with the views of five unelected justices. “If a bare majority of justices can invent a new right and impose that right on the rest of the country, the only real limit on what future majorities will be able to do is their own sense of what those with political power and cultural influence are willing to tolerate,” Alito had written in his dissent. 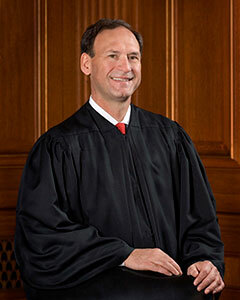 Alito was a U.S. Attorney in New Jersey and based in Newark while a member of the 3rd Circuit Court of Appeals. He was nominated to the High Court by President George W. Bush and has served since 2006.